Evisceration Plague is the eleventh studio album by American death metal band Cannibal Corpse. The album was produced at Mana Recording Studios by Hate Eternal guitarist Erik Rutan. The album entered the US Billboard 200 at number 66, selling 9,600 copies its first week. In Cannibal Corpse, our goal has always been to try and make each new album we record our heaviest. That goal was a bit more challenging this time since we were extremely satisfied with our last album Kill, but we knew that by working with producer Erik Rutan at Mana Recording Studios again, we would be able to start at that same level of heaviness and take it even further... Evisceration Plague has the best guitar sound we've ever recorded, and the entire band has never played with more precision and power. In another interview with Terrorizer magazine, drummer Paul Mazurkiewicz stated his thoughts on the album saying: "I think working with Erik again has definitely brought things up a little for us. I mean all the band were involved in the writing process of this album along with Rutan and so I think this one's a tad more individual than Kill." The cover art was released December 14 and samples were made available through Amazon.com. The album was released with a bonus track in Europe and DVD as a deluxe edition. An autographed version of the album is now available for pre-order on the Metal Blade Records website. It is the fifth Cannibal Corpse album to contain a title track (following Butchered at Birth, The Bleeding, Gallery of Suicide and The Wretched Spawn) and a video was produced for the song. They also released a comic book where each song has its own comic. A video for the song "Evisceration Plague" was released on May 9, 2009 on the YouTube account of Metal Blade Records. A video was produced for the song "Priests of Sodom". The video was released on March 25, 2010. Erik Rutan – guitar solo on "Unnatural"
Neil Kernon – production, mixing only "Skull Fragment Armor"
Justion Leeah – engineering only "Skull Fragment Armor"
Sonic Ranch, Tornillo, TX, USA – recording only "Skull Fragment Armor"
^ Staff writer(s); no by-line. "Cannibal Corpse “Evisceration Plague” - Metal Blade Records". www.metalblade.com. Metal Blade Records. Retrieved February 12, 2015. ^ a b "Cannibal Corpse Chart History (Billboard 200)". Billboard. ^ Teitelman, Bram. "Metal By Numbers – 2/11 – Death Metal In Top 100? Of Corpse! - Metal Insider". www.metalinsider.net. Retrieved February 12, 2015. ^ "CANNIBAL CORPSE: New Album Title, Track Listing Revealed - Nov. 3, 2008". blabbermouth.net. 2008-11-03. Archived from the original on 2008-12-21. Retrieved 2008-11-03. ^ "Cannibal Corpse Posts New Music Video For "Priests Of Sodom" Online". ^ Bowar, Chad. "Cannibal Corpse Evisceration Plague Review - Review of Evisceration Plague by Cannibal Corpse". heavymetal.about.com. About.com. Retrieved February 12, 2015. ^ Prato, Greg. 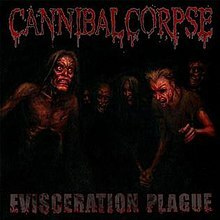 Evisceration Plague - Cannibal Corpse at AllMusic. Retrieved February 12, 2015. ^ Alisoglu, Scott. "CD Reviews - Evisceration Plague Cannibal Corpse - Blabbermouth.net". www.blabbermouth.net. Blabbermouth.net. Retrieved February 12, 2015. ^ Deneau, Max (February 9, 2009). "Cannibal Corpse Evisceration Plague". exclaim.ca. Retrieved February 12, 2015. ^ Falzon, Denise (February 17, 2009). "Cannibal Corpse Evisceration Plague". exclaim.ca. Retrieved February 12, 2015. ^ Fisher, Mark. "CANNIBAL CORPSE – Evisceration Plague (2009) - Album / EP Reviews @ Metal Forces Magazine". www.metalforcesmagazine.com. Metal Forces. Retrieved February 12, 2015. ^ Herzebeth (February 20, 2009). "Cannibal Corpse - Evisceration Plague review - Metal Storm". www.metalstorm.net. Metal Storm. Retrieved February 12, 2015. ^ Begrand, Adrien (February 12, 2009). "Cannibal Corpse: Evisceration Plague - PopMatters". www.popmatters.com. PopMatters. Retrieved February 12, 2015. ^ McIver, Joel. "Evisceration Plague - Record Collector Magazine". recordcollectormag.com. Diamond Publishing. Retrieved February 12, 2015. ^ Spencer, Trey (January 29, 2009). "Review: Cannibal Corpse - Evisceration Plague - Sputnikmusic". www.sputnikmusic.com. Sputnikmusic. Retrieved February 12, 2015. ^ Evisceration Plague (liner notes). Cannibal Corpse. Metal Blade Records. 2009. ^ "Austriancharts.at – Cannibal Corpse – Evisceration Plague" (in German). Hung Medien. ^ "Ultratop.be – Cannibal Corpse – Evisceration Plague" (in French). Hung Medien. ^ "Cannibal Corpse: Evisceration Plague" (in Finnish). Musiikkituottajat – IFPI Finland. ^ "エヴァイスレイション・プレイグ - カンニバル・コープス - ORICON STYLE". ^ "Official Rock & Metal Albums Chart Top 40". Official Charts Company. ^ "Cannibal Corpse Chart History (Independent Albums)". Billboard. ^ "Cannibal Corpse Chart History (Top Hard Rock Albums)". Billboard. ^ "Cannibal Corpse Chart History (Top Rock Albums)". Billboard. ^ "Cannibal Corpse Chart History (Top Tastemaker Albums)". Billboard. This page was last edited on 16 March 2019, at 06:40 (UTC).